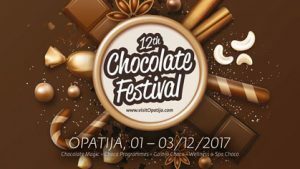 Opatija’s sweetest event on the first weekend in December presents the best Croatian and international chocolate brands, and small specialized manufacturers who produce original chocolate desserts. The chocolate exposition and sales area is located at Crystal Ballroom of Hotel Kvarner, where exhibitors present the best of their products. Further exciting events such as workshops, lectures, tastings, concerts and exhibitions dedicated to chocolate, take place in Opatija’s hotels and restaurants, art galleries, exhibition pavilions, museums and schools. Local confectioners unite to make the big “Imperial Cake”, and a special part of the event is the “Opatija Paradox” where various chocolate flavours are combined under expert guidance with quality wines from the region.